Why is Pouring Concrete Coping Around a Fiberglass Pool so Difficult? As I've mentioned before, one of the beauties of having a national pool blog is the fact that I get emails from all over the country from people who have experienced good, bad, and ugly during their swimming pool installation and ownership process. When it comes to fiberglass pools, one of the subjects I hear most about has to do with concrete patios, and more specifically, cantilever coping. In the past, fiberglass pools were labeled as ‘bathtub-y' due to the fact that so many builders poured the concrete patio up to the lip of the fiberglass, versus over the lip (cantilevered) as it is usually done today. The problem with pouring cantilever concrete around a pool though, especially a fiberglass pool, is that it's rather difficult to do unless you've practiced the skill multiple times. You see, cantilever concrete around a fiberglass swimming pool requires the installation of special forms that are made of Styrofoam. These forms are temporarily attached to the lip of the fiberglass and once the concrete decking has been poured, they are stripped off and what's left is a bull-nose finish (hopefully). The problem that most contractors have is that when these forms are stripped off, the coping that's left can be jagged, honey-combed, and extremely unsightly. This is mainly due to improper installation of the forms as well as improper handling of the forms during the concrete pour. I've even seen many cases where large clumps of coping have simply been ripped off the pool deck when the forms were removed. Obviously, such occasions are disastrous for the aesthetics of any pool and can be extremely difficult to repair without tearing concrete out. Your pool's patio, and coping, will make or break the entire look of the project. I don't care how many ‘pool decks' a concrete finisher has poured, all that matters is the number of ‘cantilevered concrete decks' around a fiberglass pool he has poured. Do not allow your pool's patio to be a contractor's guinea pig. The picture shown here was sent to me by a homeowner who had his pool's concrete poured by someone who frankly didn't know what they were doing. 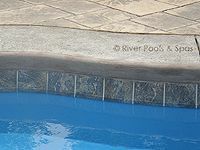 They are a perfect example of what can go wrong when pouring concrete around a fiberglass pool and should be a reminder to everyone of what can go wrong if your don't do the proper leg work in choosing the right contractor for your swimming pool project. "Marcus, I bought a fiberglass pool direct from the manufacturer. They helped set the pool and backfill it but now I'm not sure who is going to do the concrete. Who should I call?" Such moments make me slap my forehead because in some parts of this country, there simply aren't contractors that have any clue whatsoever as to how to pour concrete around a fiberglass pool. Often times these homeowners end up settling on ugly non-cantilevered concrete or they end up finding someone who will do a stone/block coping instead, which is pretty expensive. So keep this in mind as you prepare for your swimming pool installation in 2010 and if you have any questions/comments about fiberglass pool decking whatsoever, make sure you write them below, as we LOVE hearing from our readers!